Tucked away on a narrow lane in Perth, Western Australia, this compact eco-house has been imagined as a nature-inspired hideaway by sustainable design firm Etica Studio, founded by architect Carla Karsakis. The solar-passive home runs on renewable energy and was built using a mix of eco-friendly materials and salvaged elements, such as its double-height wall made from reclaimed windows. 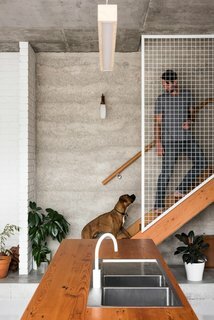 The external structure is made from rammed earth and concrete rubble (that would otherwise have gone to landfill), with other recycled elements used throughout—from 1960s bricks to 100-year-old pine floorboards. The design was conceived in collaboration with the architect’s sister Tanya McKenna and her partner, Peter Chadwick, who own the home. They drew from a "rich palette of eclectic references" for the interiors, ranging from a love of Scandinavia and South America to an appreciation of midcentury design and a preference for "honest materiality." For the kitchen, the goal was to create a light, bright, cafe-style entertaining space. Brazilian architecture informed the concrete backdrop, while a penchant for 1960s design inspired the pale timber-and-ply units and the graphic, grid-like tiled countertops. 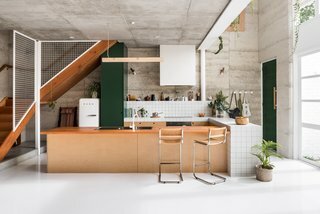 Fremantle-based furniture makers Raw Edge crafted the cabinetry; other timber pieces, such as the box light suspended above the island, were made by Chadwick. 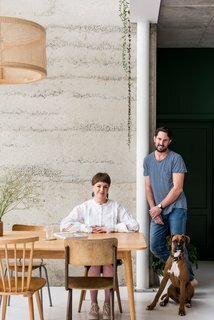 "We wanted to integrate more sustainable elements and reclaimed materials," says Karsakis, "so we sourced the Oregon bench top from an old pub outside Perth." Sustainability focused Etica Studio designed this eco-house to be a nature-inspired hideaway for its owner, the architect's sister. The solar-passive home runs on renewable energy and was built using a mix of environmentally friendly materials and salvaged elements. Other requirements on the wish list included a large work surface, areas for display, and separate zones for cooking, preparation, serving, and entertaining. One of the major challenges the architect faced was designing the kitchen beneath the staircase. "I needed to make sure this wouldn’t impact on the overall look," she explains. "And from a detail perspective, designing exact dimensions around the two different sizes of tiles was very challenging as we wanted to avoid cutting them." The Oregon wood used for the countertop on the island unit is reclaimed, and came from an old pub on the outskirts of Perth. A lot of time and thought went into ensuring that the combination of materials worked. 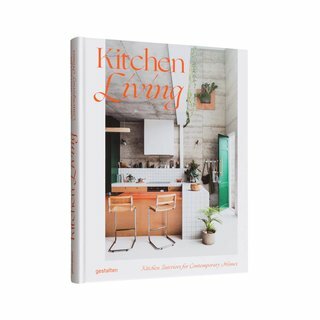 "I love how the different uses of materials delineate separate spaces and functions, such as the tiled areas for preparation and cooking and the Oregon wood for serving and entertaining," she adds. 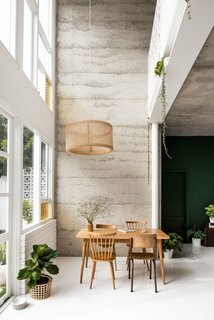 A pale polished floor helps to bounce around the light that floods in through the double-height wall of reclaimed windows. Accents of green and wooden pieces add to the nature-inspired feel. The finished space is relaxed and airy, with the casual, cafe-style feel that the trio set out to achieve. Favorite details include the hit of forest green introduced with the painted pantry cupboard and the home’s front door—McKenna tried six different shades before finding the perfect hue—and the tiled plinth behind the stove area. The latter acts as additional storage to keep the countertop free of clutter, as well as serving as a display space that gives the kitchen its personal feel. 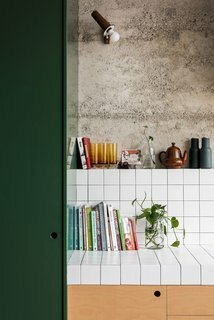 The ply and Oregon elements offset the rawness of the concrete walls, while the pale polished floor and white tiles bounce the abundant light around the space.